This month marks one whole year of issues for our bathroom newsletter, The Scoop! It’s a birthday party! Naturally, we had to get a cake. For those of you not on the second floor of the Medical Education building, The Scoop is the name of our monthly newsletter that features information on events going on at the library, app recommendations, and other useful information and tidbits. It is posted in the stalls of the bathrooms closest to the library, and is a fun way to engage our library patrons. The Scoop is also housed on our website, so you can download PDFs of each issue. Celebrate Multicultural Day at the COM! We hope you’ve had a great Diversity Week and had a chance to go to some of the sessions during the week. If you happened to miss any of our activity on Twitter, we’ve been posting links to relevant resources and exhibits to do with Diversity in Medicine this week. Be sure to check out our feed for links to a number of National Library of Medicine provided resources; all of our tweets have “#DiversityWeek” attached to them. Today at 4:30pm on the Piazza, the College of Medicine Office for Diversity and Inclusion will round out the week with a Multicultural Day Celebration. 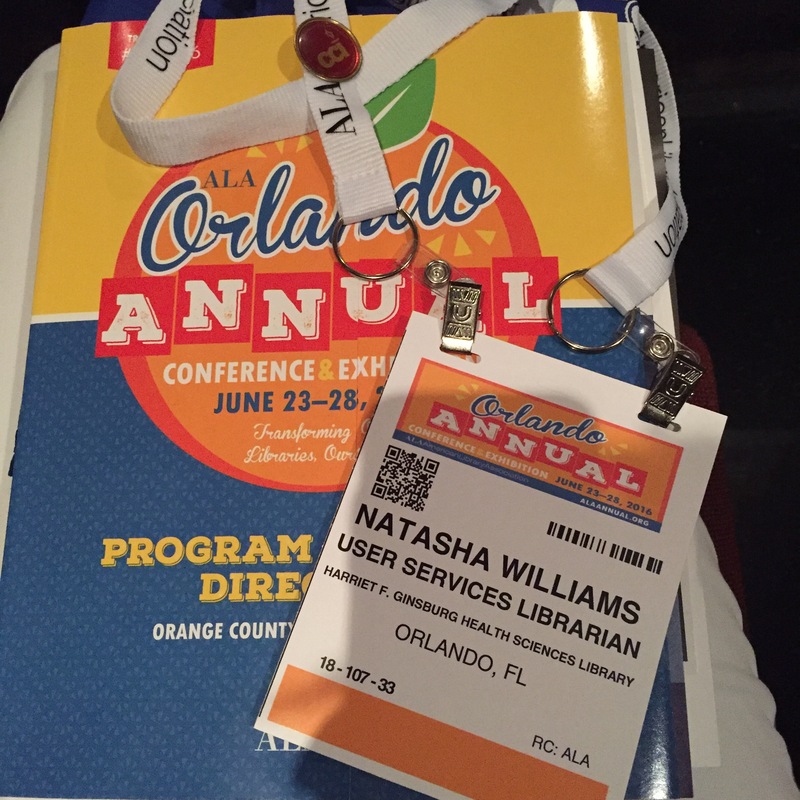 One of our library staff, Natasha Williams, is in charge of the planning committee for the event. A lot of work has gone into making the event successful, but what’s a party without a crowd to have fun with? She encourages everyone to come out to enjoy samples of international foods and drinks, and enjoy a unique performance by some of our students at the Burnett School of Biomedical Sciences. There’s plenty of fun to be had, so please consider stopping by before you head home for the evening. The event is scheduled to conclude at 6:30pm. We hope to see you there! 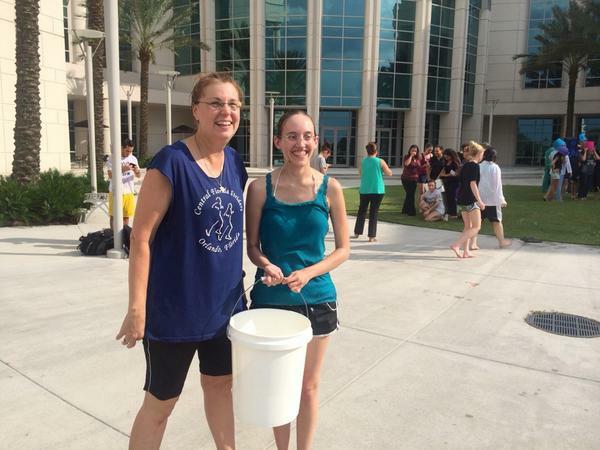 Library Staff take the ALS Ice Bucket Challenge! What’s better than hanging out with co-workers on a hot Friday afternoon in sunny Orlando in late August? Though “hanging out in the air-conditioning instead” is always an acceptable guess, having the opportunity to cool off and give to charity at the same time is the winning answer this time around. Last Friday, various faculty, students and staff at the COM participated in the ALS Ice Bucket Challenge campaign that was been sweeping social media over the past few weeks. The goal of the campaign is to bring awareness of the disease and raise money to further research of it. According to the ALS Association website, as of this past Monday the 25th, donations had reached a staggering $79.7 MILLION since the campaign started a few weeks ago. Considering that during the same time period a year ago donations totaled around $2.5 million, it looks like the campaign has made a huge splash. 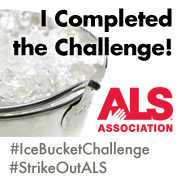 It works like this: If you’re challenged to take the ice bath, you have 24 hours to do so or you have to make a donation to fight ALS. Lots of people do both! It’s fun to challenge your friends and watch the videos they have posted on social media to prove they did in fact take the challenge. At the COM, the Dean of the college was challenged (along with everyone else in the building) by our new Internal Medicine residents. 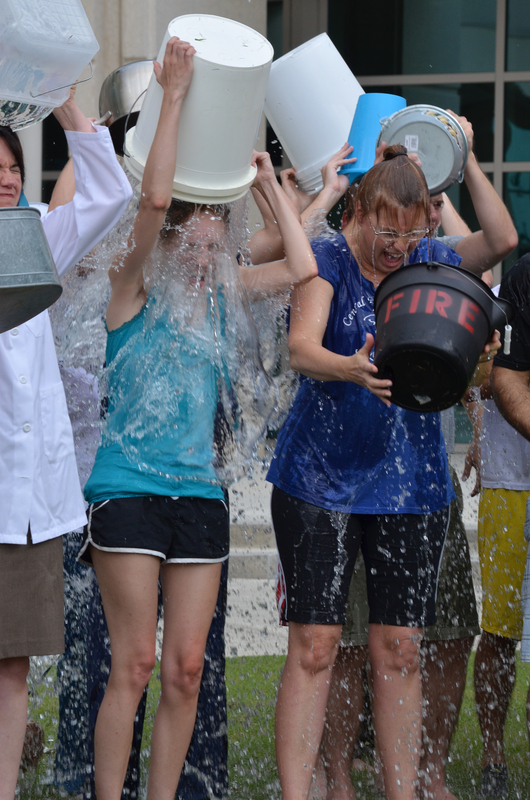 What resulted was a wave of a hundred or so buckets of ice water over the heads of our faculty, staff and students. Check out the video below! Amongst participants were our library Director, Nadine Dexter, and one of our Senior Library Technical Assistants, Melodie Gardner. Great job, guys! Afterwards, Nadine decided to issues challenges to the library directors at FIU’s medical library, and UCF’s John C. Hitt Library. We’re looking forward to seeing those videos! Good thing it’s summer, right? What a refreshing way to make a difference. If you’d like to learn more about ALS and how you can help, visit the ALS Association website. If you have visited the 2nd floor bathrooms near the health sciences library lately, you may have noticed something different. The health sciences library’s newsletter, The Scoop, is posted on the wall in each bathroom stall! Find out about current happenings in the library, learn about new library resources and services, or read a funny (library-related) comic. Check back each month for a new edition. Not on the second floor at COM? 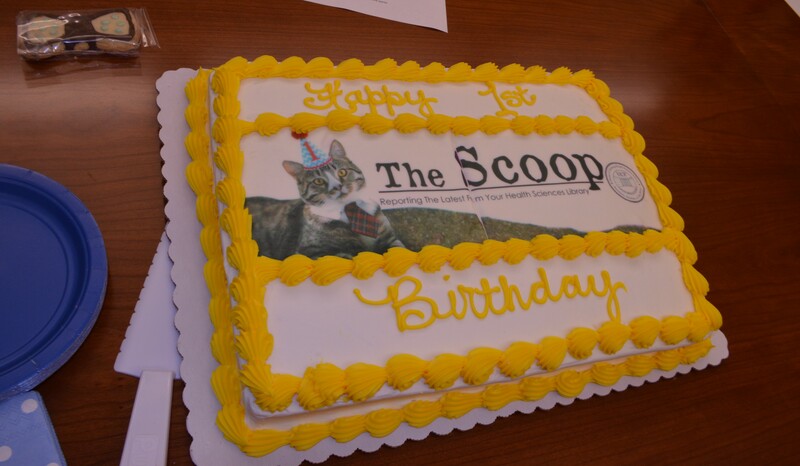 You can read the latest and back issues of The Scoop on our website. Today we wish to extend our sincerest congratulations to the new doctors of the UCF College of Medicine Class of 2014! Here are some photos from the event. Of special note, did you know that we had a student serving in the United States Air Force in this class? The College of Medicine actually has a number of students serving in various branches of the Armed Forces. Upon receiving her M.D. 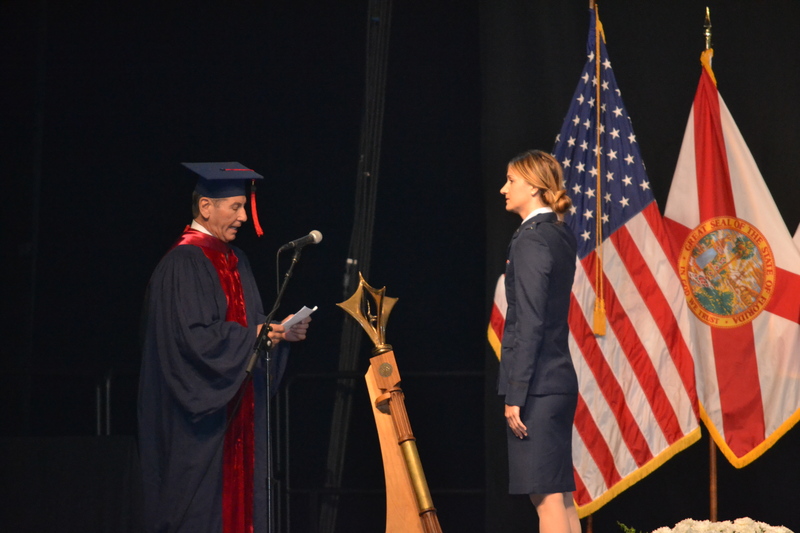 distinction, Casey deDeugd was promoted to Captain from First Lieutenant. 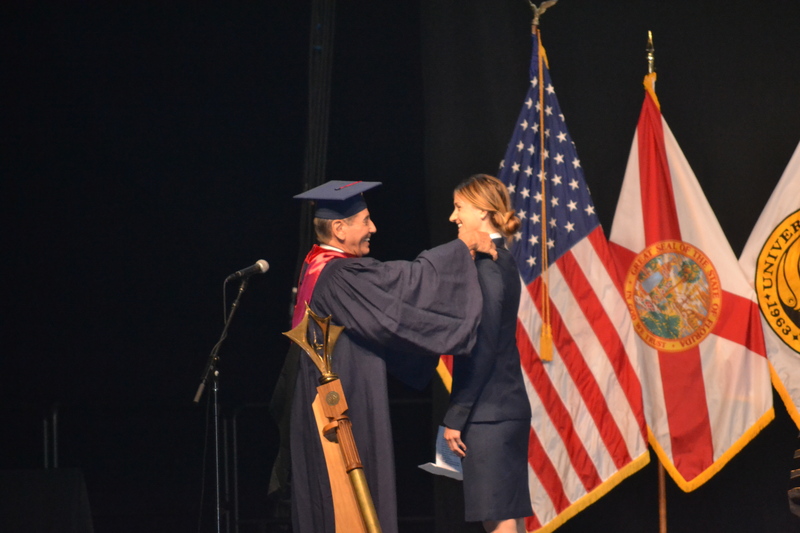 Dr. Borrero is shown here swearing her into her new position. Great job Casey; thank you for serving! 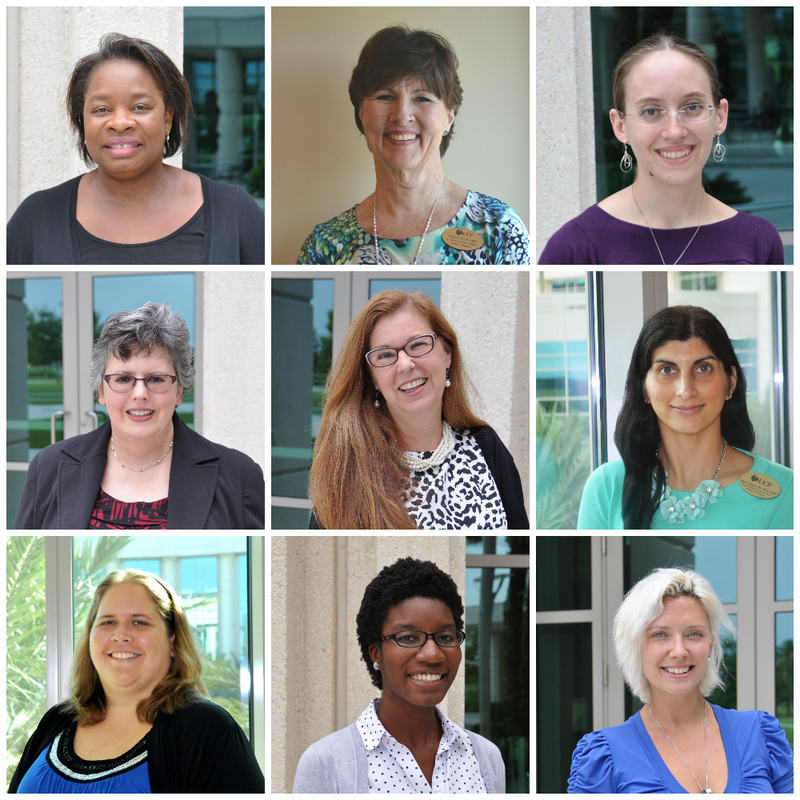 We look forward to seeing how our new alumni will succeed! Go Knights! Spring has sprung and the COM is busy! Lots of great events going on this week at the College of Medicine! Today and tomorrow, the 1st and 2nd year students are participating in the 5th annual FIRE Research Conference. The Focused Inquiry and Research Experience Conference showcases the completed research projects of our second year medical students. 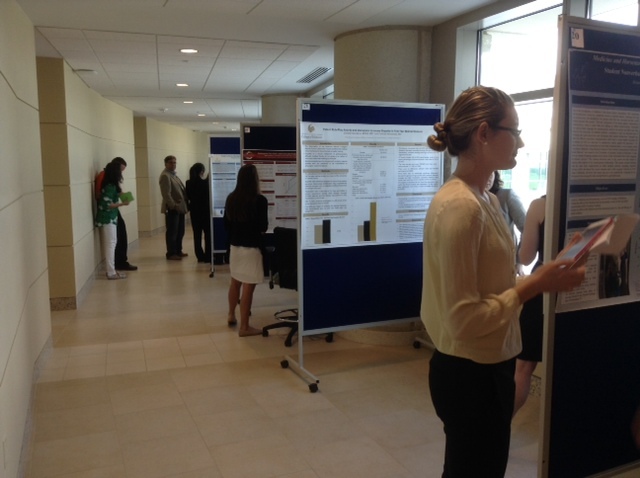 Select first year students also give oral presentations of projects they will complete in their 2nd year. Visit the 4th floor tomorrow from 9:00am – 12:00pm to discuss the M2 projects with each researcher, and COM102 from 1:00 – 5:00 today and tomorrow for the oral presentations. Follow us on Twitter @ucfcomhsl to see pictures from today and tomorrow! Additionally, tomorrow the College will be celebrating its second Match Day as the Class of 2014 finds out where they will be venturing off to complete their residency programs. We did a great post explaining what Match Day is last year when our Charter Class matched, so give it a look if you’re interested in learning more about this tradition. We’ll also be posting pictures from this happy event tomorrow on our Twitter, so look out around noon for those! Today is also Popcorn Day! We hope to see you in the library at 3pm. Happy Thursday! Come check out our new exhibit and get a treat! 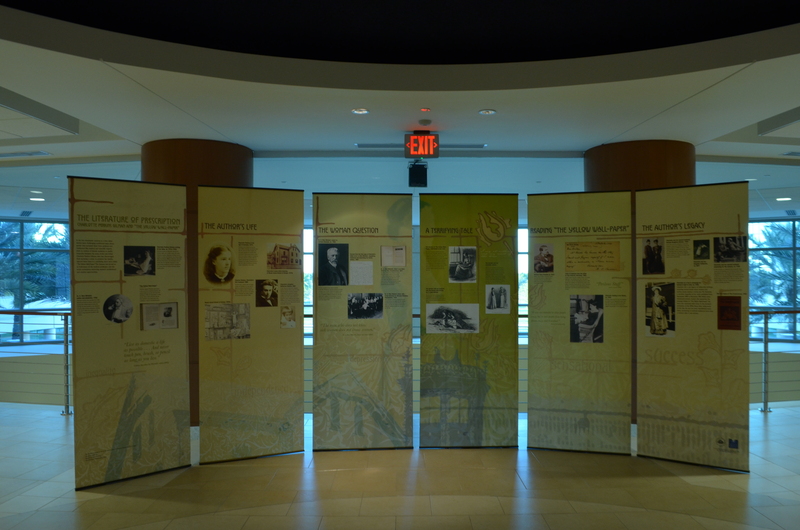 You may be wondering about the group of large poster panels currently on display in the library Reading Room; they make up the latest exhibit we are borrowing from the National Library of Medicine! Did you know that in Shakespeare’s time, human personality, along with physical and mental health, were described by the interaction of the four “bodily humors” – blood, bile, melancholy, and phlegm – a theory that has long since been discarded? 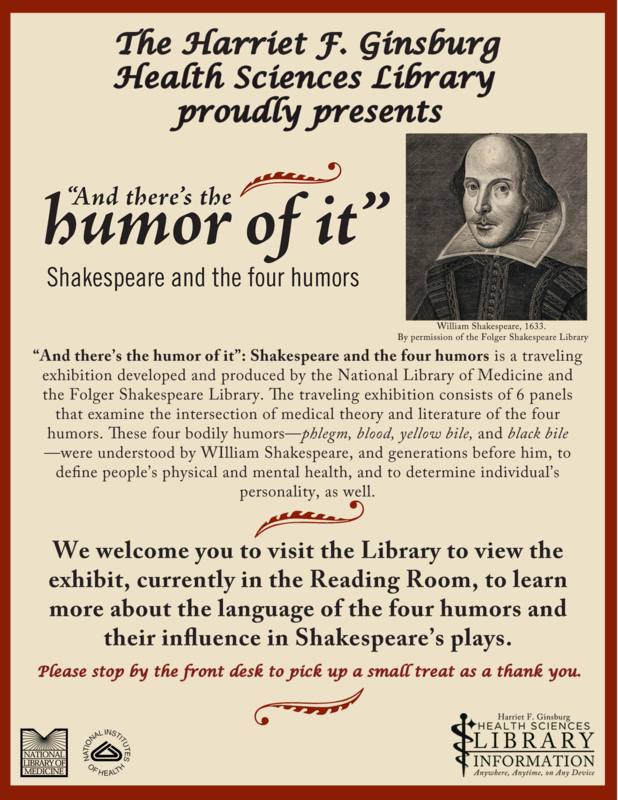 Shakespeare’s plays are filled with references to this theory, and so this exhibit examines the intersection between literature and medicine! Please feel free to stop by the library to check out the exhibit if you have an opportunity – we have a small treat for you to show our thanks. If you can’t make it, stop by the exhibit website to learn all about it!